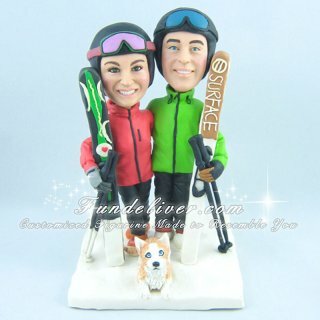 This is a completely customized Couple Skiing Cake Topper ordered by one of our customers. They would like the figurines to be posed the way they are in the photo and with a dog at their feet. Thanks for their perfect photos, they are so clear to figure out the pose and snow ski gears and equipments they love and want the figurine to have (holding each other with their inner hands and snowboards with outer hands). The only unclear point is the bride’s boots, they are orange and little pink square on the top which are covered by snow. Luckily we have our 2D designing stage to confirm every detail of this couple skiing cake topper as showed at left part of above image. For the base and background, we made a white square base like snow ground to match their skiing wedding theme and idea. You might notice there are some mosaics on their face section of above image. We take our clients’ privacy very seriously, without their permission we will never put their portrait images on our website, so sorry we can’t show you the likeness about figurine. But you can simply know it by the client’s email. HOly Smokes that is so crazy they look just like US! This is awesome. Thank You! Perhaps you and your fiance/fiancee met in this ski theme. Why not have all your smiles, ski boards or ski poles put in your wedding cake toppers? 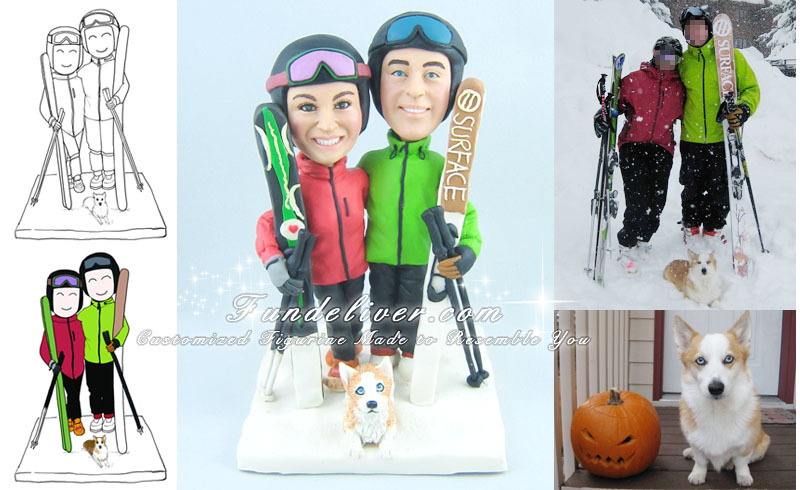 Don’t forget to check the following for more Skier Wedding Cake Toppers and Skiing Wedding Cake Toppers.